It’s not often that we stumble across a bathroom where we’d really want to spend a lot of time. But this particular bathroom we could linger in for hours, soaking up the industrial ambiance while soaping up in the shower. 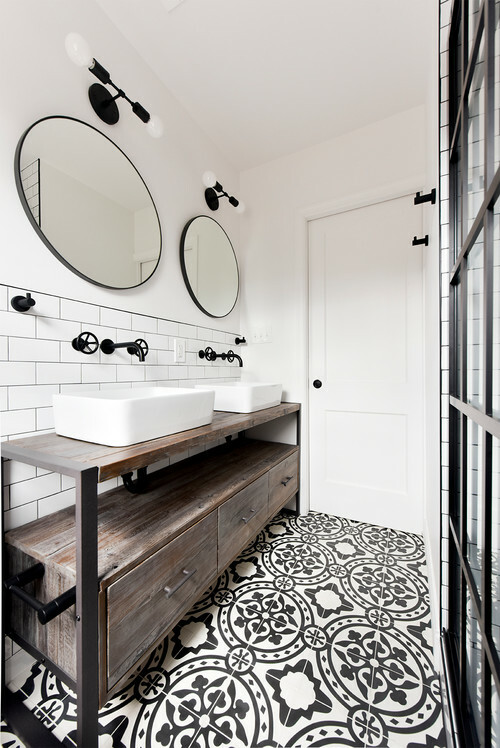 What we love: the use of classic fixtures, subway tiles in the shower and cement tiles on the floor, in a very graphic, bold and modern way. The bathroom was truly small before the renovation. It measured only 33 square feet before it was enlarged and reconfigured by breaking into a nearby linen closet. It now measures 49 square feet. The designer was able to maximize space by using a pocket door rather than a swing in door, and dispensing with a tub altogether. Exchanging a few traditional elements allowed the owners to add a few touches of luxury. For example, the double sinks. But what really makes this bathroom a stand out are the fixtures. 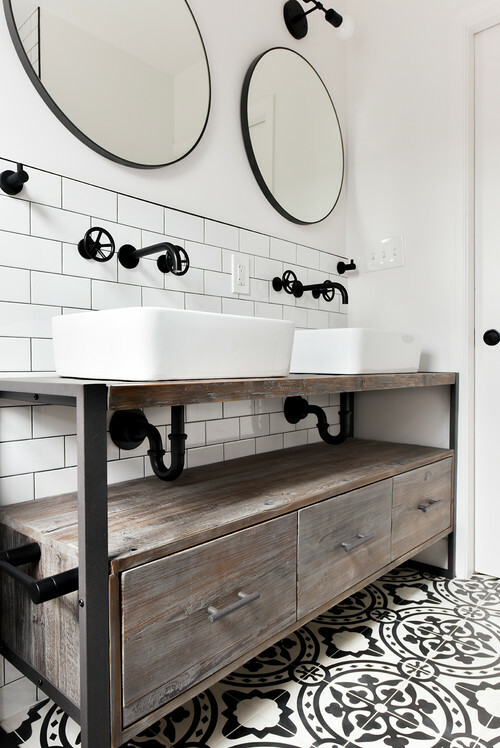 The vanity is actually a repurposed TV console of reclaimed wood. It worked perfectly because it was open enough not to have to worry so much about fitting in the plumbing underneath. The industrial faucets of black metal recall the wheels of a train. 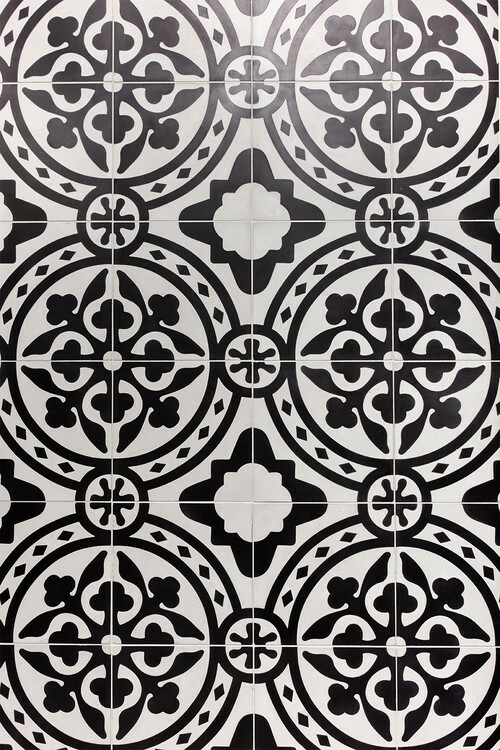 The railroad theme was an important one, since the house is located near the railroad tracks and the owners wanted to use this motif in their renovation. 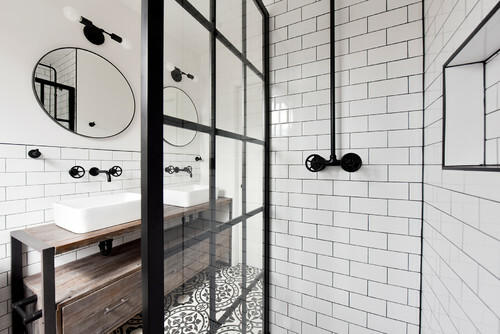 The P-traps underneath the sink were also found in a matte black that works with the industrial-style pane glass of the shower and the faucets. 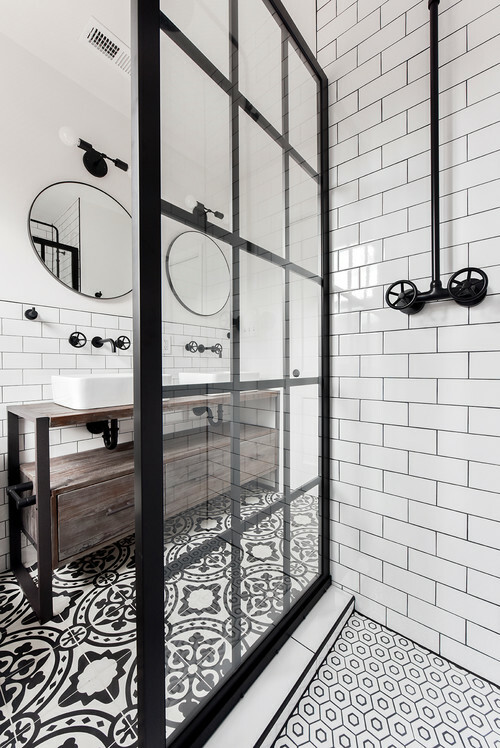 And the coup de grace in this modern yet old-fashioned bathroom is the black and white encaustic cement floors.These are the types of floors commonly found in homes in Old World Europe and which have been making a resurgence in the design world in recent years. 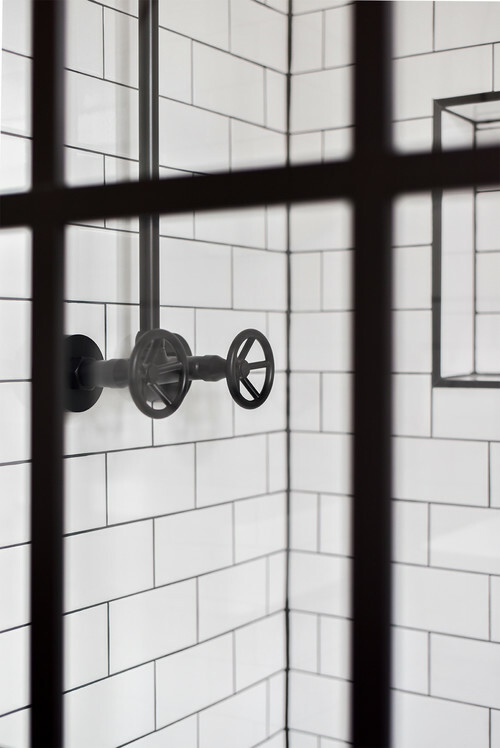 The faucets in the shower carry on the industrial theme look and match the faucets of the sinks. 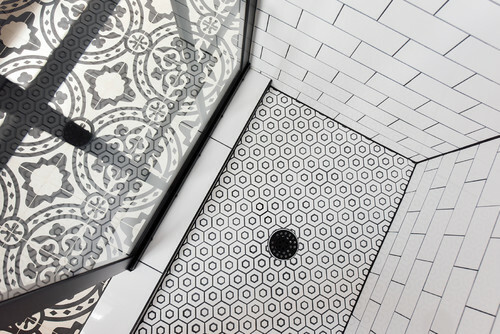 The hexagonal floor tile in the shower looks fabulous against the subway tile and the cement tile of the main floor. The glass panel of the shower is fixed, and designed for easy clean-up. It is paned on the outside, but inside one flat service to allow for easy cleaning. 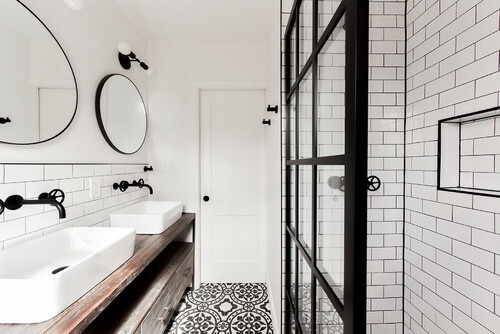 Clean, classic, graphic, bold —- we love how this bathroom has come together! This entry was posted on Tuesday, July 10th, 2018 by preynolds and is filed under Interiors. You can follow any responses to this entry through the RSS 2.0 feed. You can leave a comment.